Hello all! The big day is here and we’re transferring our blog to our self hosted website – so hold on to your hats…It’s going to be fun and exciting and barely noticeable to you. Ha. I’m telling you this because when we move our email subscribers will continue to receive email notifications as before but WordPress.com followers will only see new posts in the reader – you will not receive email updates UNLESS you subscribe to receive those on our new site. Make sense? So, to recap. 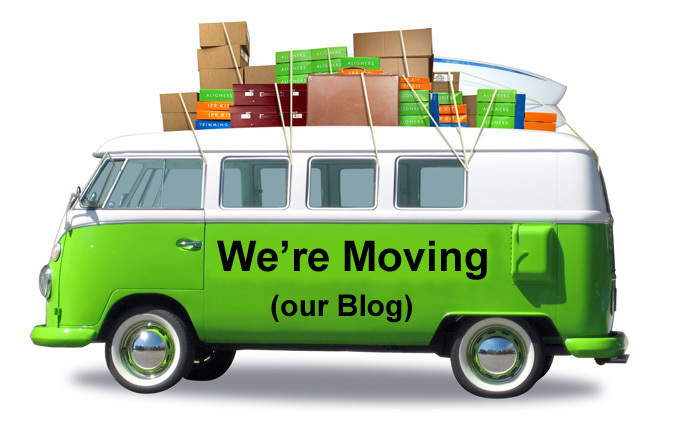 We are moving our blog to our new website so be sure to check us out there. Easy. 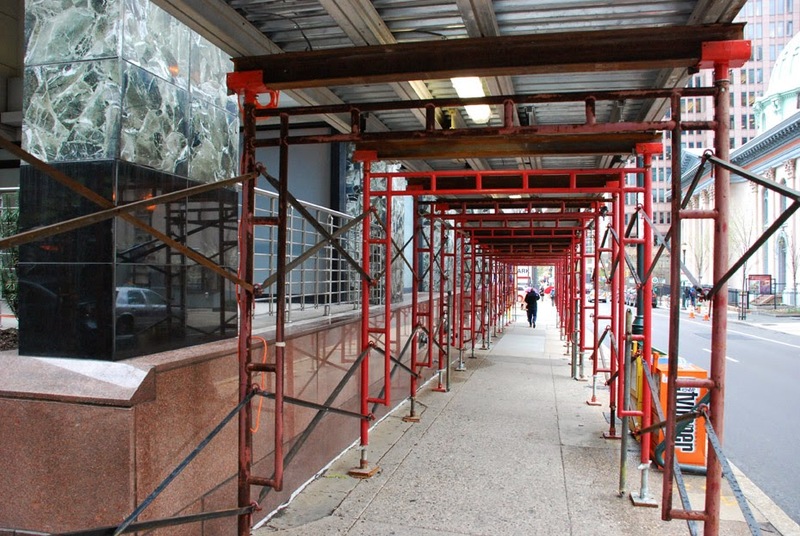 And as always, we are extremely thankful that you follow along with our scaffold travels. 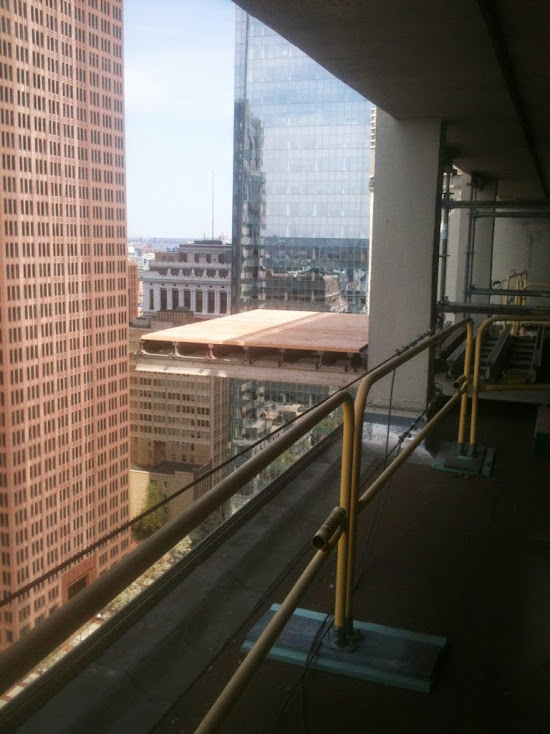 We are thinking about keeping this blog alive for the fun adventures of Superior Scaffold. 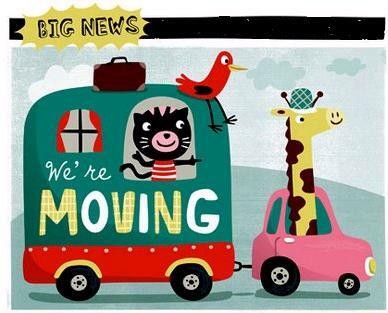 But until then we hope to see you over at the NEW SITE!!!! Thank and have a wonderful day! As Louis Prima once sang, “Swing, swing, swing” – oh wait, close… “Sing, Sing, Sing – (with a swing)”. 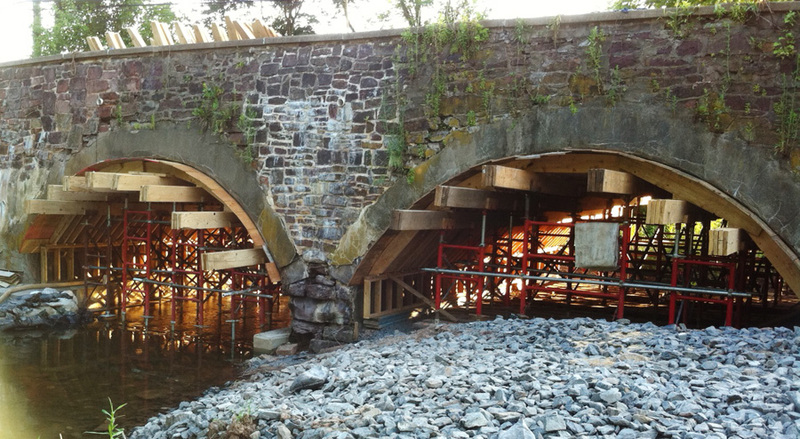 But that’s just what Superior Scaffold did on the third phase of this project (See part 1 – and part 2) – Swing, Swing, Swing. 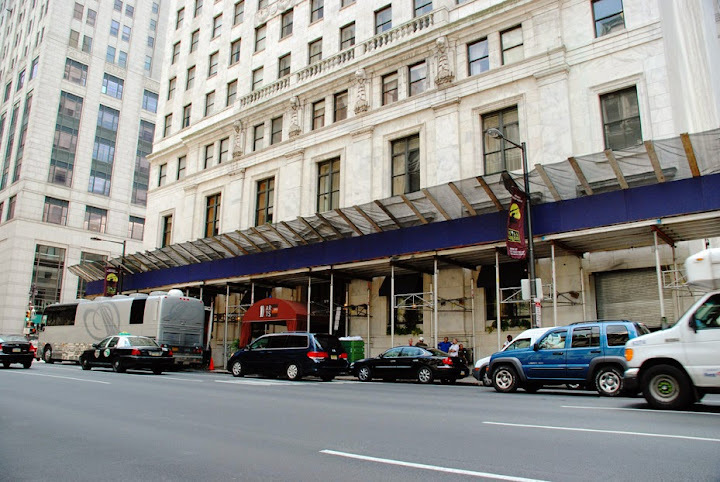 The Sterling Apartments is a unique building at the corner of JFK blvd and 18th in downtown Philly. 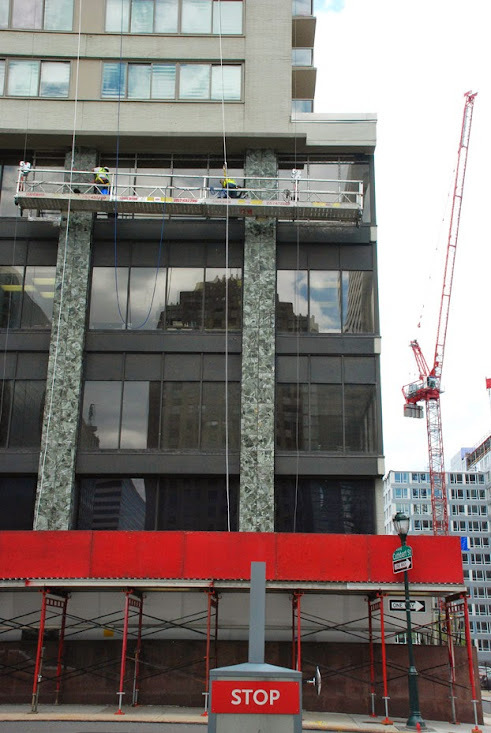 Superior had 2 36’ foot straight platforms on the front and sides of this building so crews could polish the metal on the facade. Very cool. Here you can see crews working directly from the suspended scaffolding. 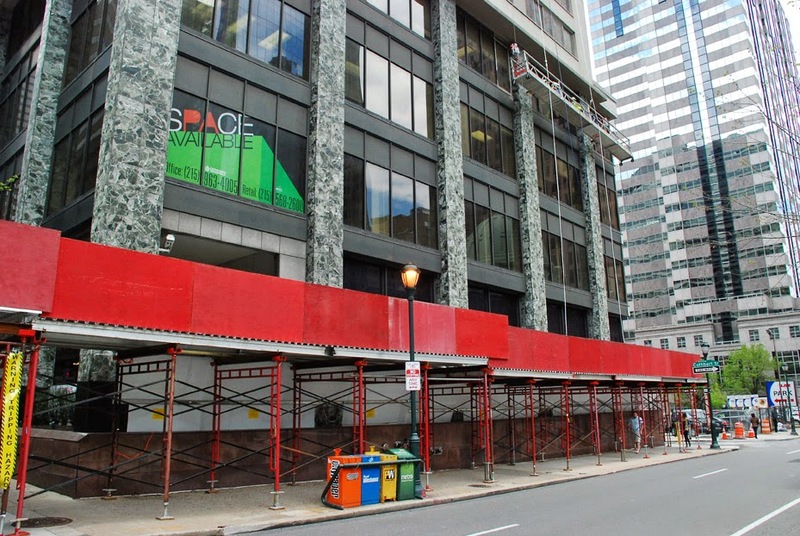 The second part of the swing scaffolding on this job came in the back of the building where they are demoing the old weight room and expanding on the 30th floor. 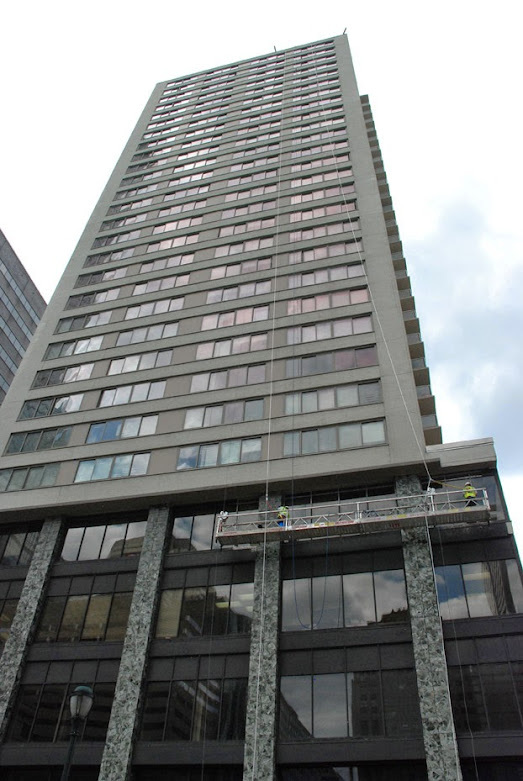 Superior provided 2 corner rigs so crews could work on the outside of the building at the top. Most people actually associate “Sing, Sing, Sing” with Benny Goodman’s famous instrumental classic but it was really Luigi (Louis) Prima who wrote and first performed the song in 1936. I’ve included both versions her so take a listen and you chose which one you prefer. And just for grins – here are the lyrics in case you want to belt it out! 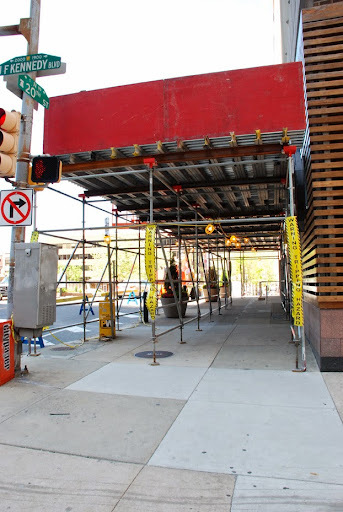 And as always, if you need to Swing, Swing, Swing around your jobsite or building – call Superior Scaffold at (215)743-2200 or visit http://www.superiorscaffold.com! 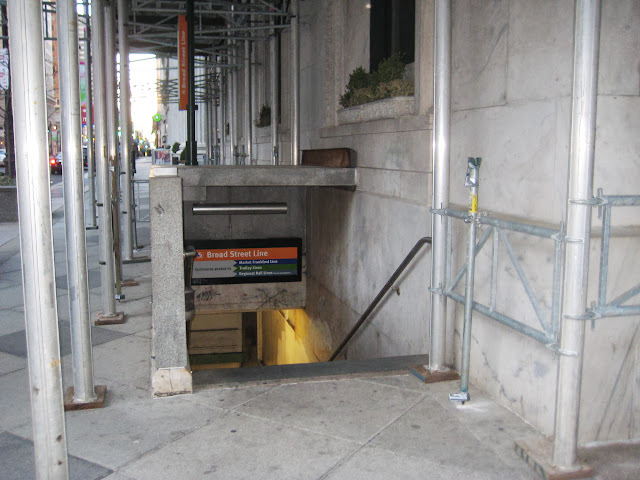 Overhead sidewalk protection all around this building. 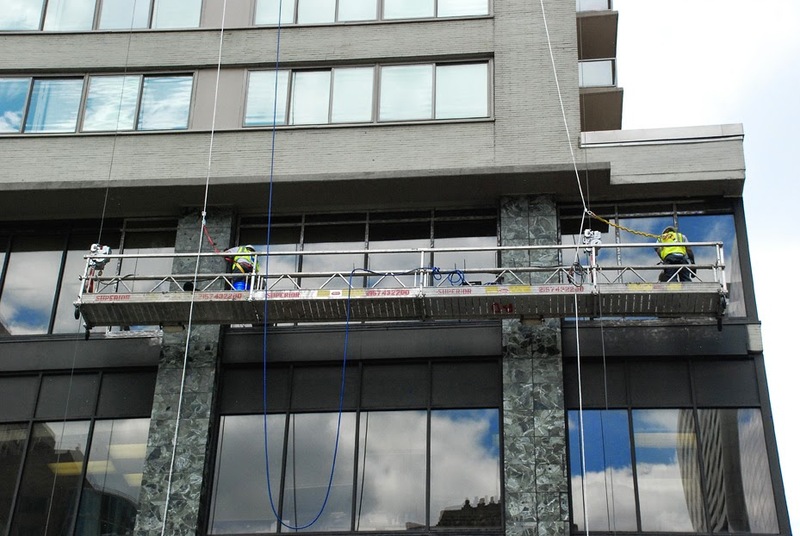 It’s a multipurpose overhead protection system (as you will see in the following pics) not only did it have to provide protection for the pedestrians around this busy apartment building but it also had to provide support for our swing staging all around the facade. 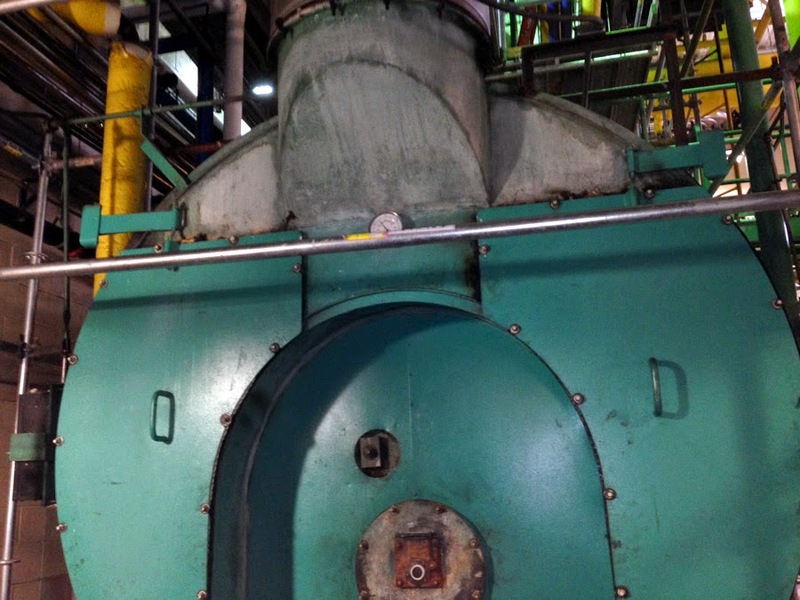 If you look to the right on the photo below you will see the tops of the motors peeking out above the panels. 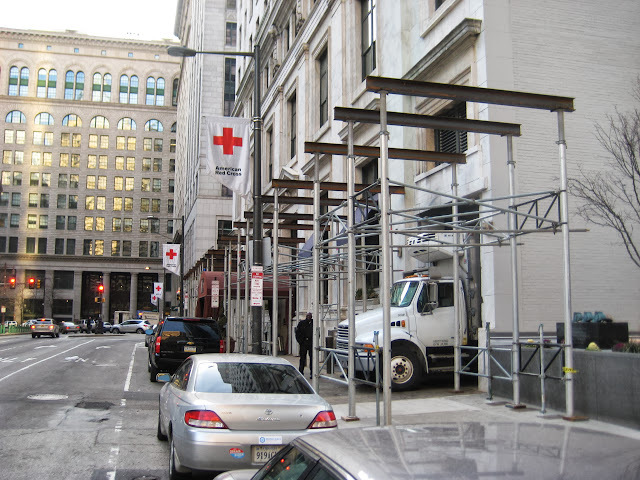 And to do this – Superior Scaffold deployed the heavy duty 767 Philly canopy frames with steel beams on top. 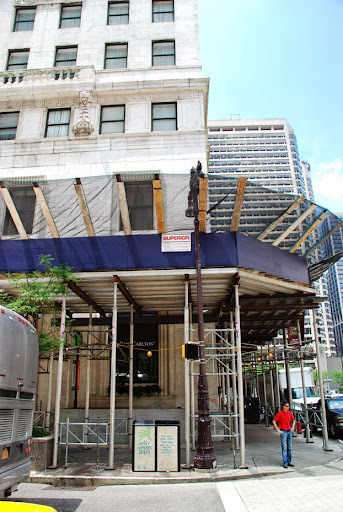 One of the biggest challenges was to create a canopy over the entryway to the Sterling House down over the sidewalk. It was quite a distance and at several elevations. 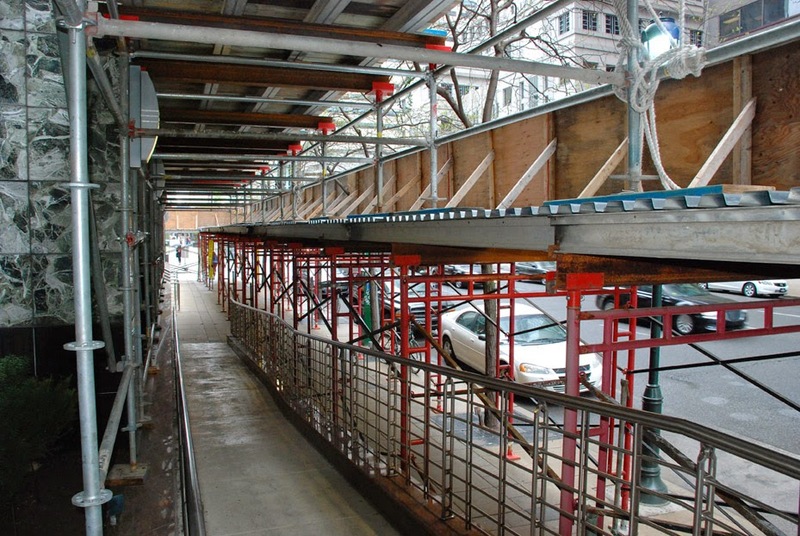 To bridge the gap Superior incorporated a series of system scaffold pieces into the overall design to create the perfect overhead sidewalk protecton for the client. It’s almost like 2 separate canopies but you can see in the pic below how the one actually rests on top of the other. This was a creative scaffolding solution to this problem. And I wanted to point out our two latest safety features. 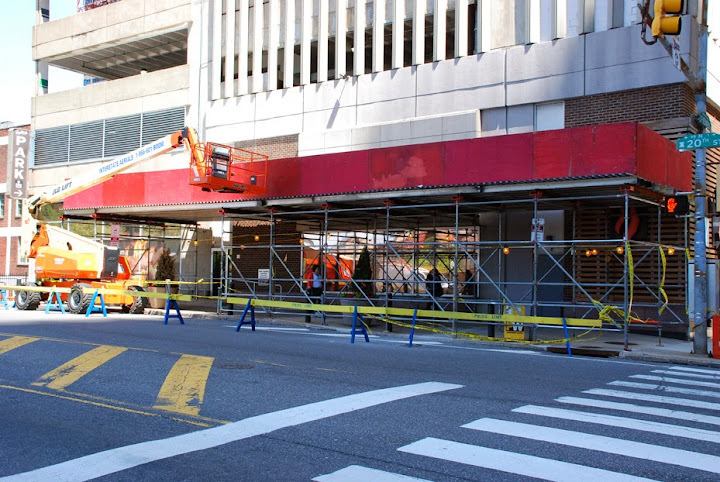 You might have already noticed the long yellow banners attached to the legs of the frame scaffold in the photos. These say “warning tripping hazard” and are in response to the number of people walking the streets while staring down at their cell phones. And the second safety change we’ve made recently comes at the bottom of the frame jack where the plate meets the concrete. We now cut off the sides of the wood to fit the size of the jack plate completely – no more overhanging area for people to get caught up on while they walk and text and surf the web. 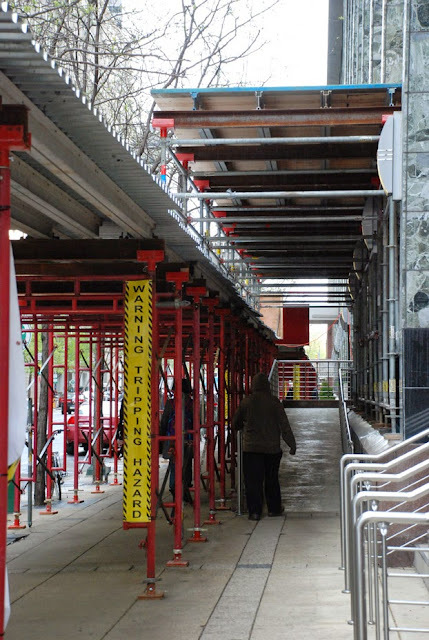 We are always looking for ways to make our scaffolding safer to the general public. We will be constantly updating and improving as new insights become available. Save some brain power for the Sterling House Pt 3 (“Swing, Swing, Swing”) coming real soon! 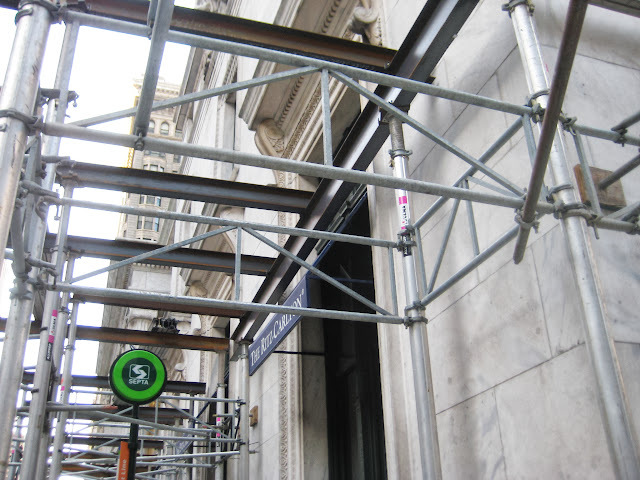 Call Superior Scaffold today at (215) 743-2200 for all of your scaffold, scaffolding needs. The resurrection of the old M. Night Shyamalan house. Judging from the story and the new pics in todays Philadelphia Inquirer piece – the renovation of M. Night Shyamalan’s old house was a smashing success. 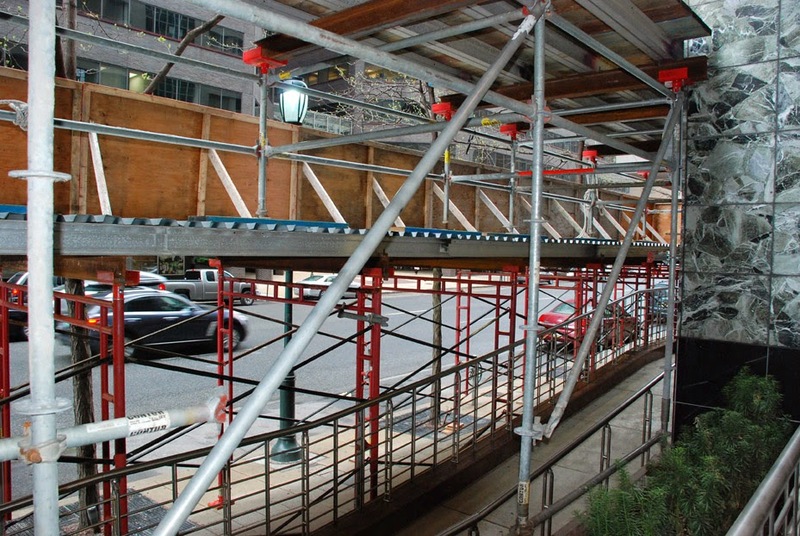 Superior provided scaffolding support all around the house during the renovation and even tented the entire structure with an enclosure system. 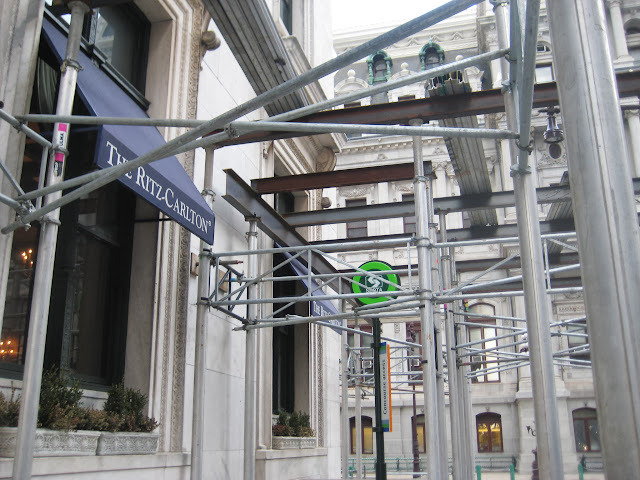 To see what Superior Scaffold can do for you – don’t hesitate to call (215) 743-2200 today. 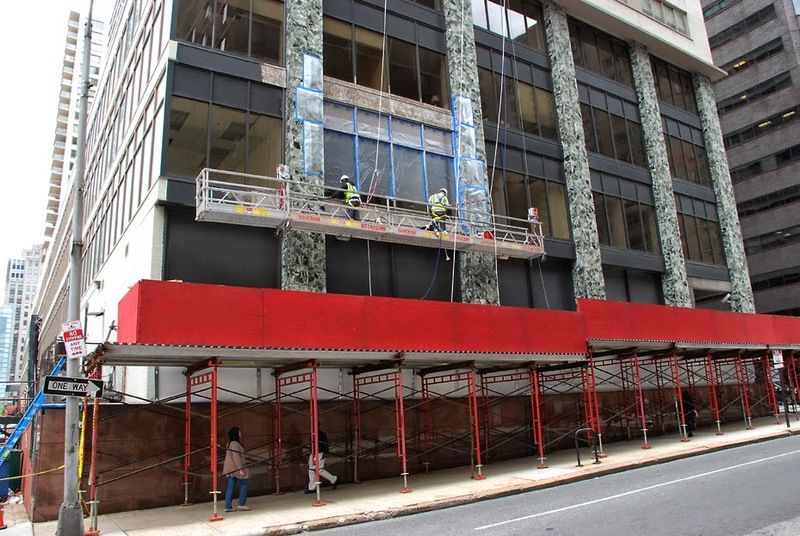 A lot of the renovation work at The Sterling House Apartments (18th & JFK Blvd) is being done at the TOP of the building. Updating the fitness center with an additional 1500 square feet, new equipment, personal TV’s, and larger windows with fantastic views of the city. Adding a rooftop social deck with lounge seating, gas fireplace, and glass windscreens all around. 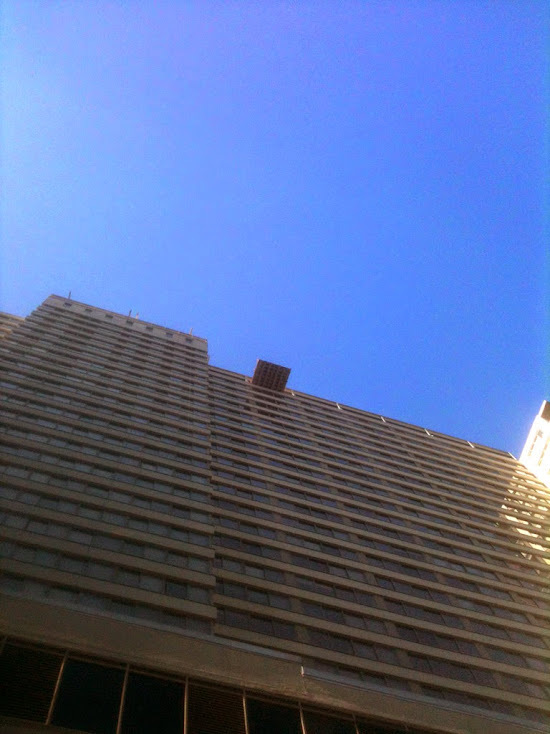 They are also doing modifications to the rooftop pool itself. 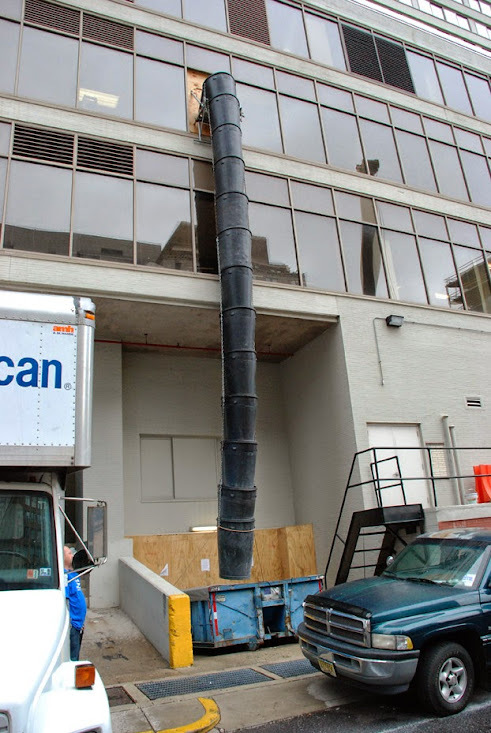 So, the million dollar question is: How do they get all of the necessary building material up to the top floor without disturbing the tenants or damaging the interior of the building? 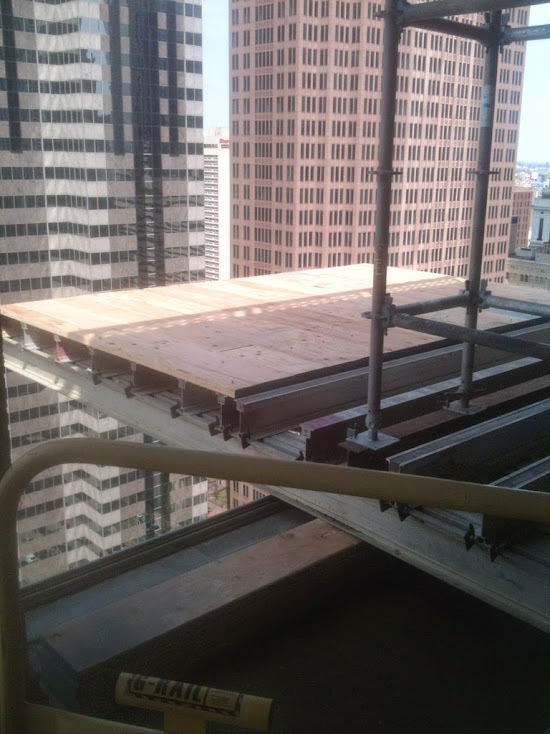 Superior erected a cantilevered LANDING PLATFORM on the 30th floor so a crane can deposit materials outside and then they can be quickly rolled into the building right where the construction takes place. Brilliant. 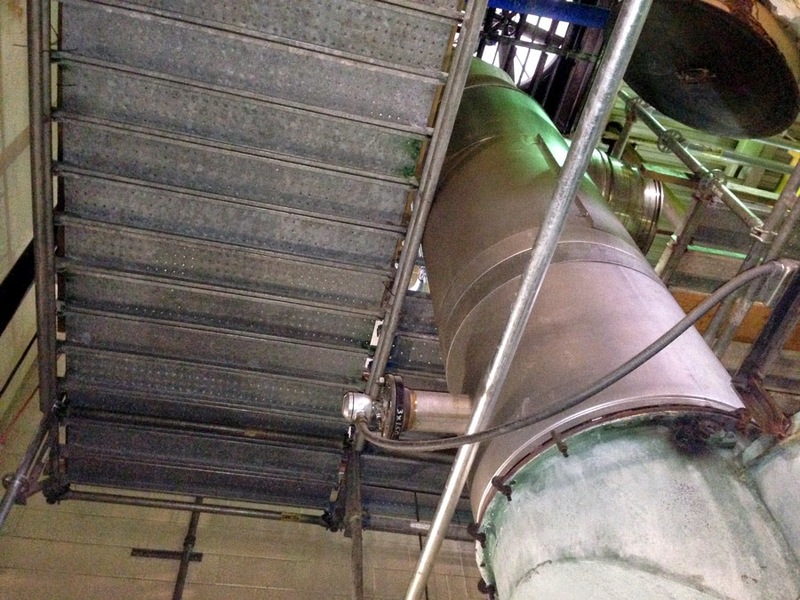 Thanks to Karl Kalbach – Competent Person, Scaffold Builder, for the great pics. The platform can accommodate 2000lbs of material and 2 men. It was rigged out of the back of the building so it’s accessible from the alley behind the complex. There is a ramp down the back so material can rolled directly into the construction area. This is beneficial in several ways. First, the tenants can have regular use of their elevators and building while construction goes on. 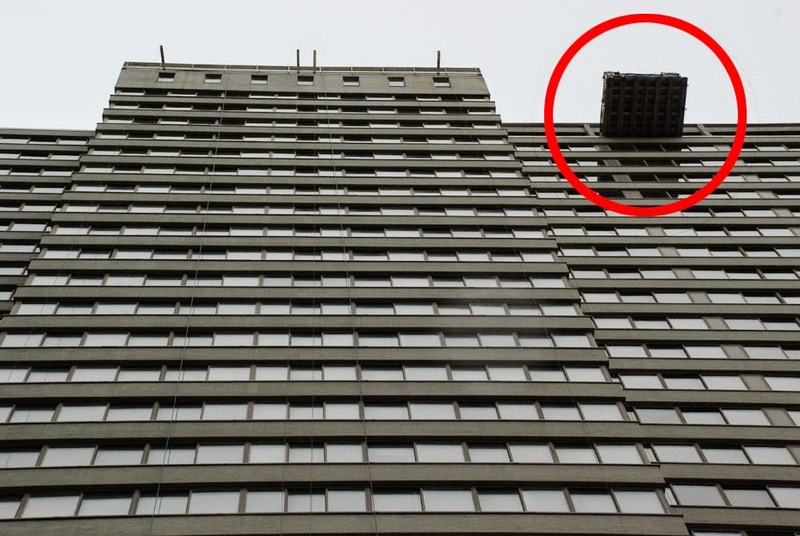 Large pieces of dry-wall and materials that might not fit into the elevators or up the stairs to the 30th floor can get up quickly without any damage to the interior. Not a new idea but a very cool one. Crews use the crane to get the necessary materials up to the desired floor. 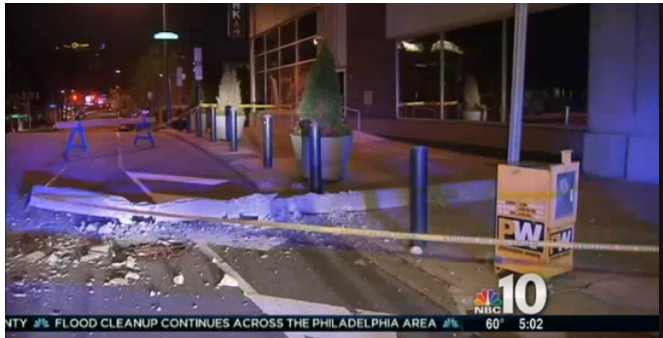 It’s all set up behind the building so it won’t disrupt the busy traffic out front. 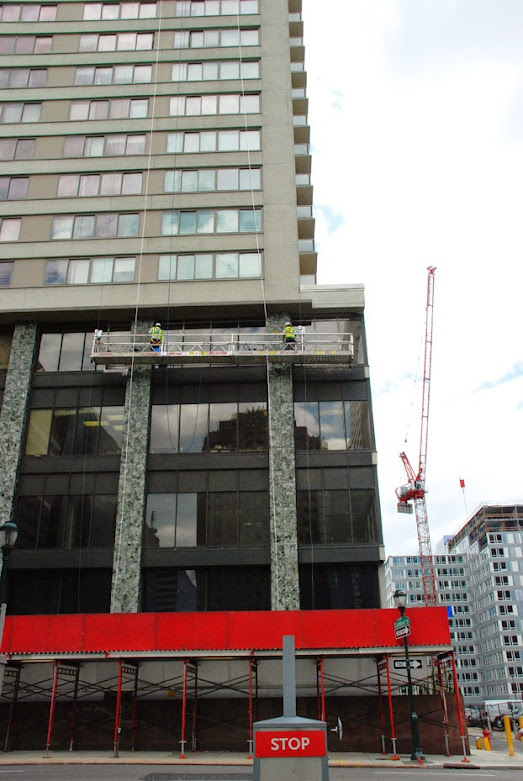 Here you get to see the crane in the background – as well as Superior Scaffold’s awesome overhead protect and swing staging working on the facade of the building. 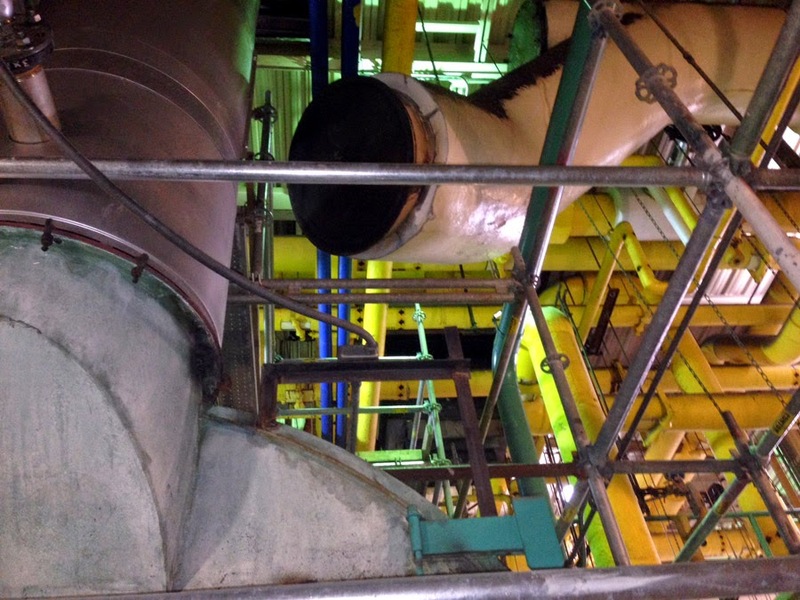 We just don’t get to see debris chutes very often and sure enough – we had one down below on this job – so here you go. 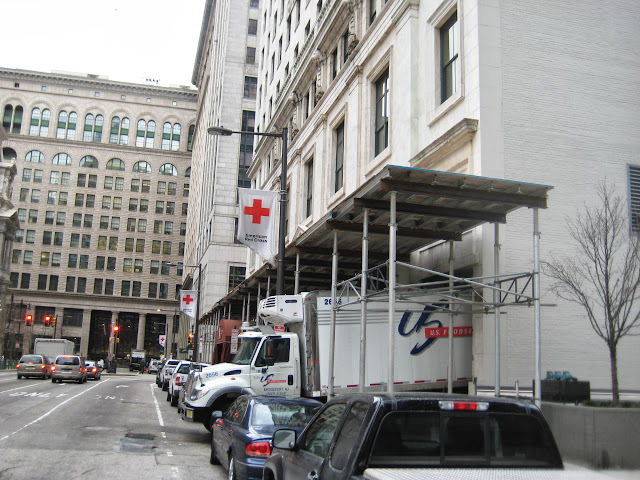 For all of your scaffold, scaffolding, equipment rental, needs call Superior Scaffold at (215) 743-2200 today. I wanted to do something a little different this time. Instead of showing tons of photos and detailing each project I thought I would let the video do the talking. In case you can’t see the link below – click on the photo above. TO THIS… In less than 12 hours! 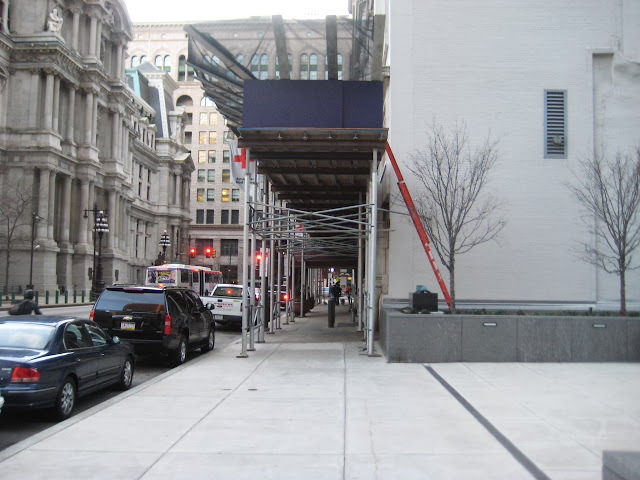 A 70 foot long, double-wide sidewalk protection system to safely shuttle pedestrians around the building. 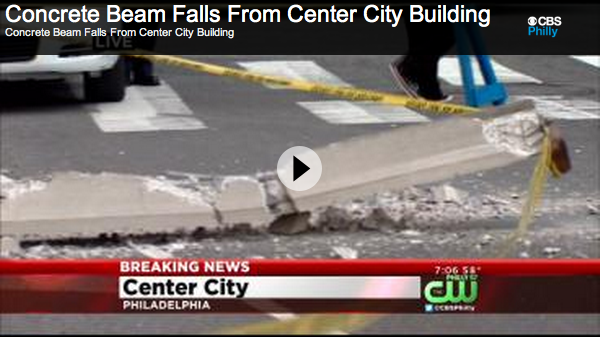 Thank goodness there were no injuries. The beam was decorative and not supportive. You can see were it came lose from the facade of the building four stories up. Angel explains the plan to Superior estimator, Pat McAndrew. On first inspection, it looks like one of the connectors might have rusted. 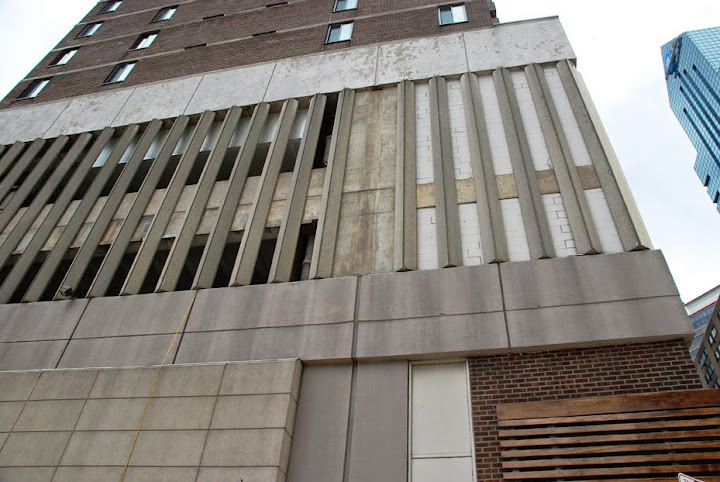 City crews can now get safely up to the side of the building. 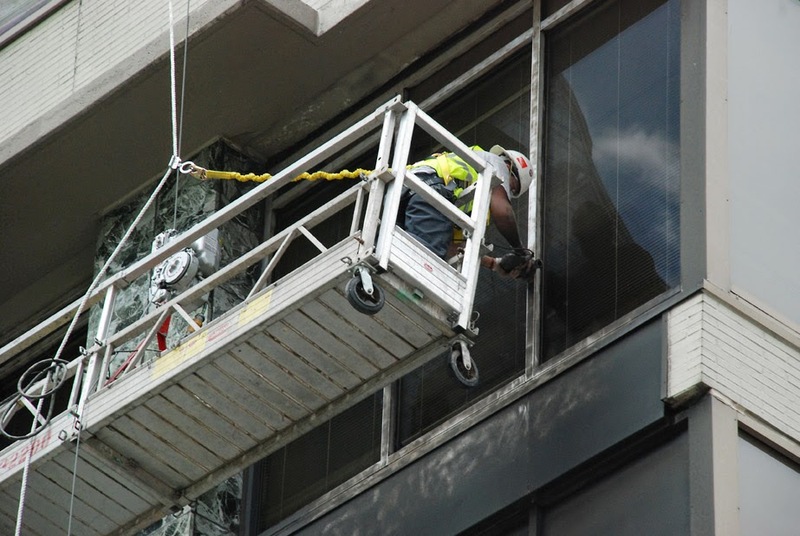 They will be using a high reach to thoroughly inspect the area and then make determinations from there. It only took one phone call to Tony Pini and several hours later Superior had a plan in place, equipment loaded up and crews ready to roll. 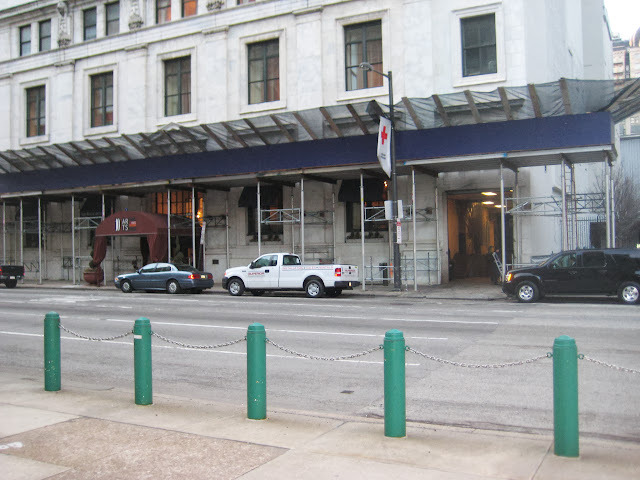 The Center City apartment complex also houses the Brazilian steakhouse restaurant, Chima. 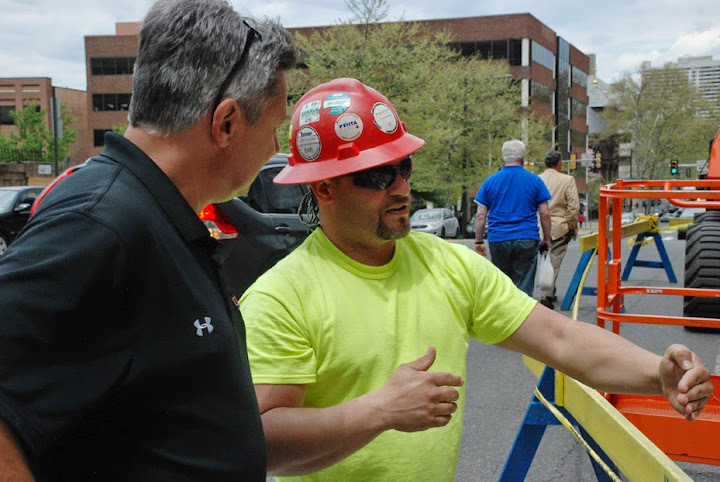 Our fast and friendly crew will get the job done right – every time! 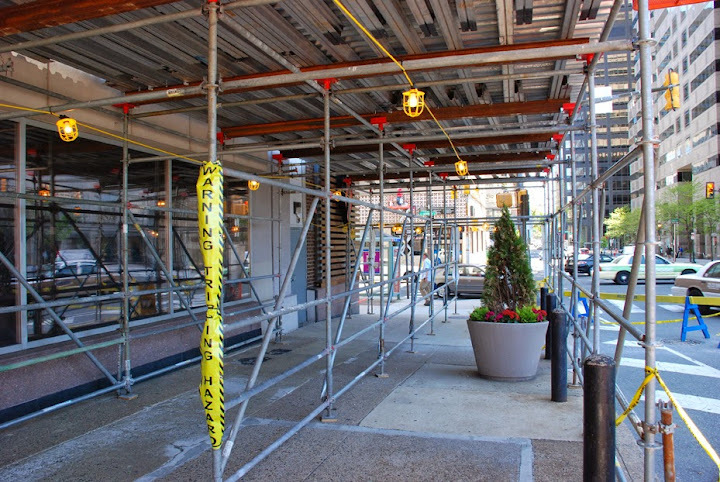 If you have an emergency where you need scaffold, sidewalk protection, canopy or scaffolding – call Superior Scaffold anytime at (215) 743-2200 and ask for Tony P.
We have the fastest response times in the business. 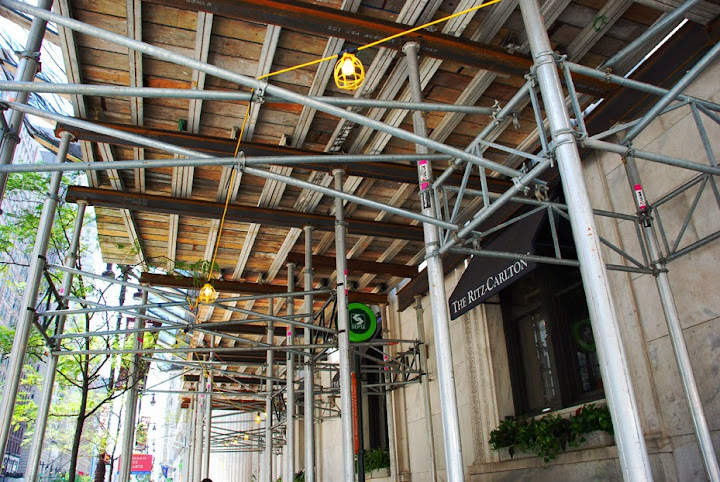 Superior Scaffold doesn’t just install the safest, best looking canopies (overhead protection) in the city we also customize them to our customer’s needs. We can match the color and content of your brand to maximize exposure for your company. 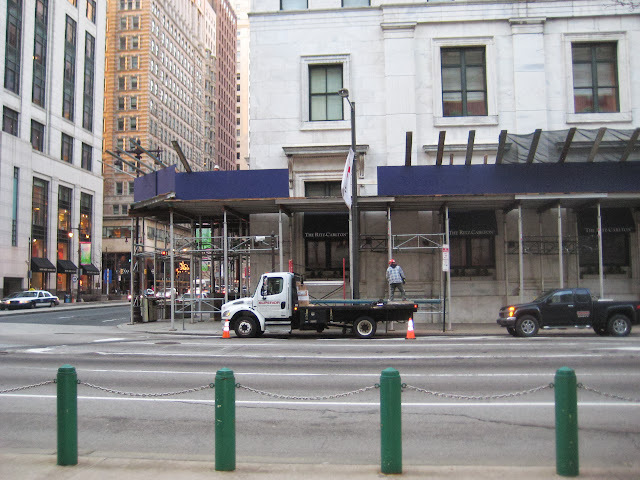 Case in point is the aluminum canopy we installed at the Ritz-Carlton Hotel, one of Philadelphia’s premiere hotels located at 10 Avenue Of The Arts, Philadelphia, PA 19102. 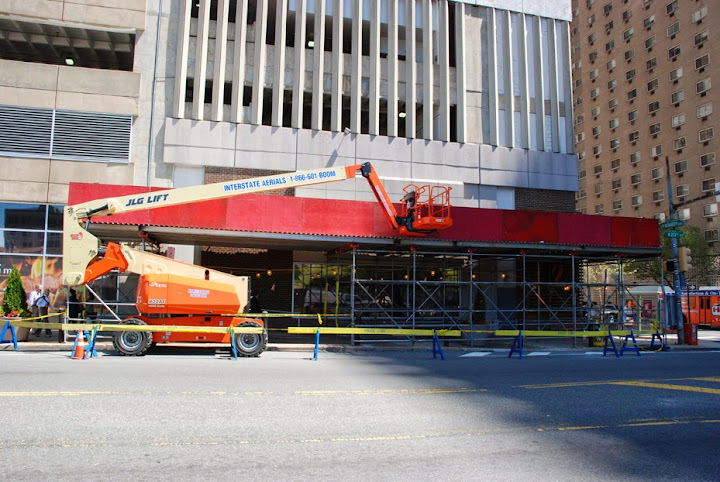 The Ritz’s elegant brand needed to be conveyed all through their facade inspection and renovation process. (that can take up to two years). Who wants an eyesore in front of their business for that amount of time? That’s why Superior Scaffold works with their clients to create the most aesthetically pleasing product on the market. 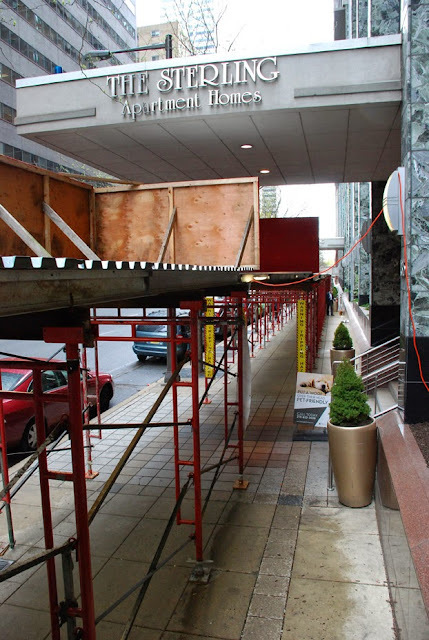 The first step on this job was to create an stylish aluminum canopy that would be tall enough to allow guests very few obstructions. 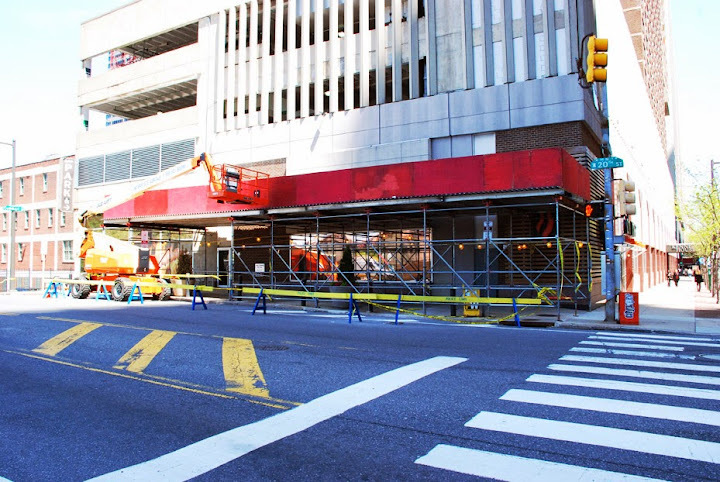 Our brushed aluminum scaffolding was just the ticket. 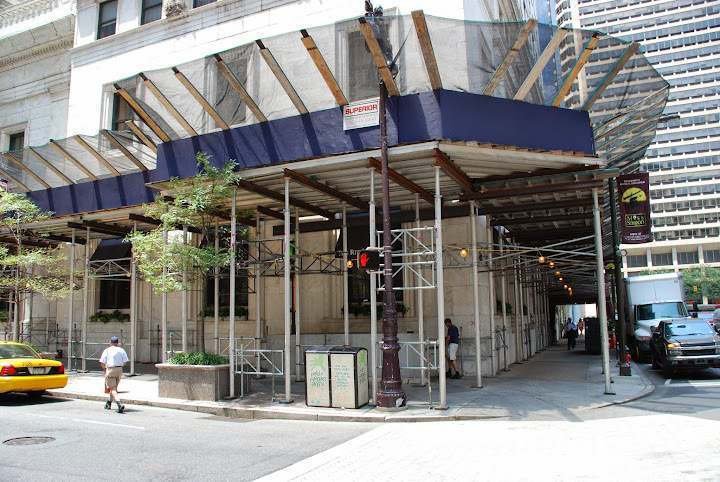 The Ritz-Carlton also wanted their luxurious blue conveyed on the outside of the scaffold as well. 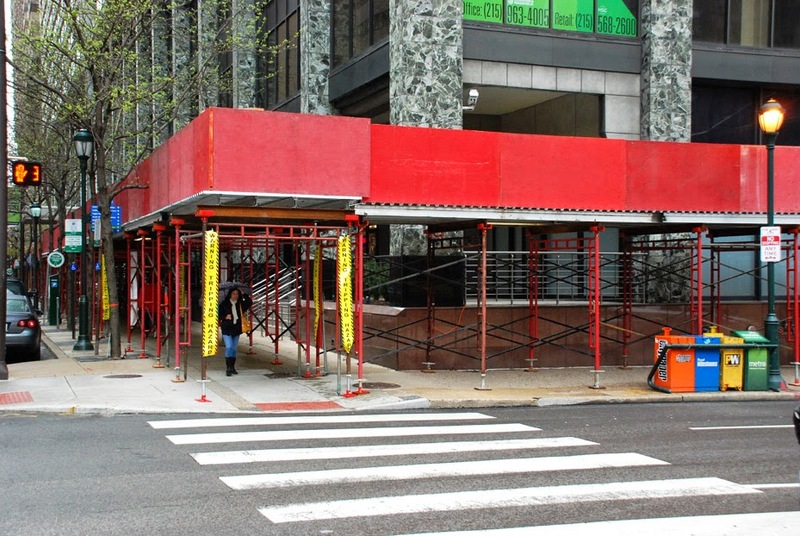 We custom painted the panels to match their logo – giving this sidewalk shed an almost regal feel. And the final touch was the special color debris netting we added to finish this functional masterpiece. Other challenges included the special beam sizes needed to span the load over the train station exit at one end of the canopy. 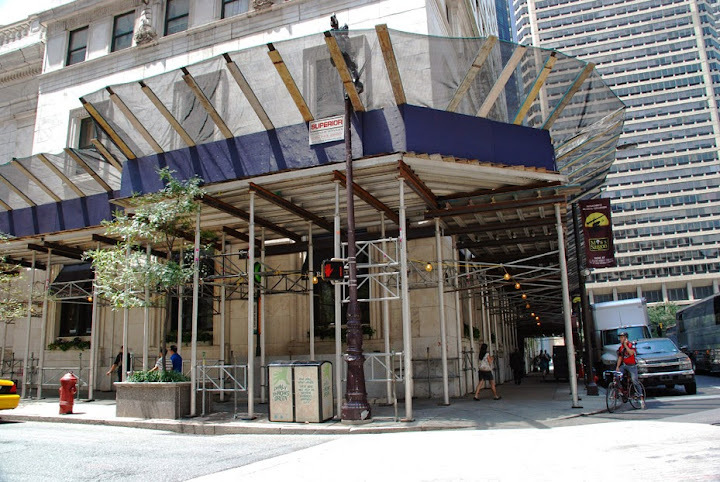 This facade work was completed and the Ritz-Carlton is looking fabulous – another satisfied client. As always, I like to show you the project being erected – so here are a few shots as the job went up. Enjoy! 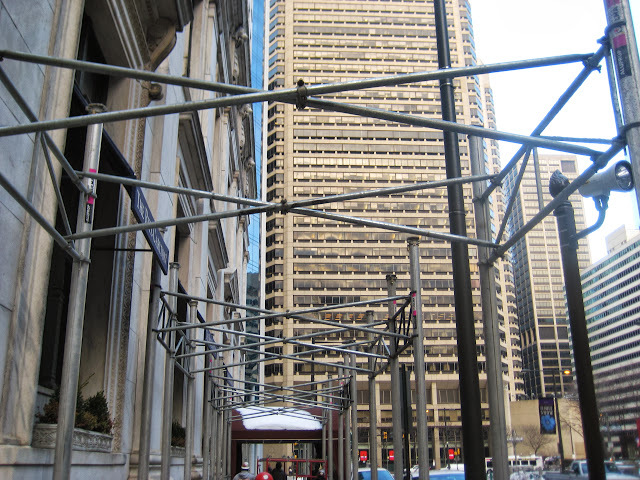 Call 215 743-2200 and ask Superior Scaffold how they can create a custom canopy for your project. 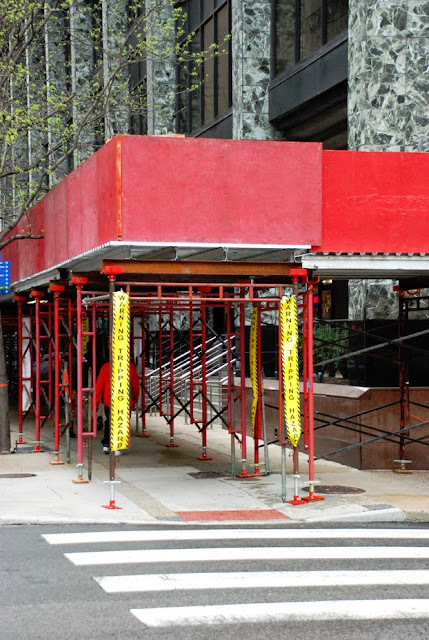 Join us next time for completely customizing your canopy – or sprucing up your sidewalk shed! 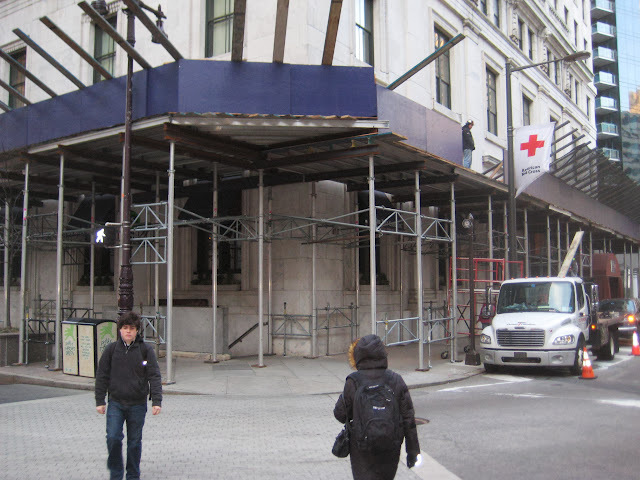 I wish that every job could be as expansive as Independence Hall, or Amtrak 30th St. Station or Citizens Bank Park / Philly Stadium but the reality is that a lot of the work we get is trying to come up with scaffolding solutions in very tight spaces. 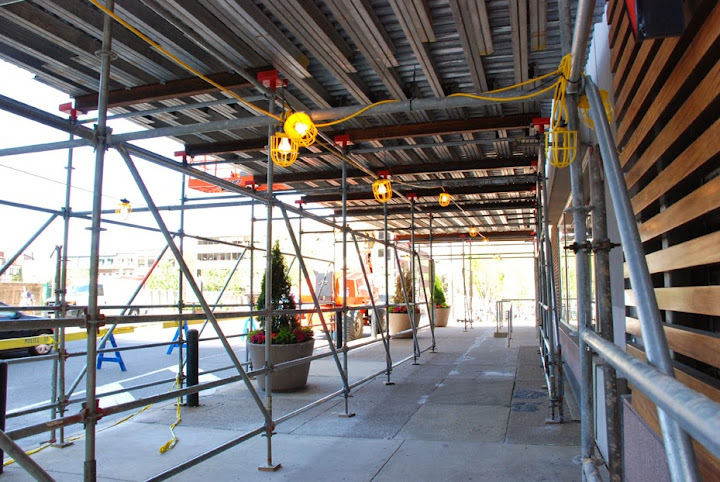 Our guys are some of the best at designing scaffold that will get crews access to just about any working space. 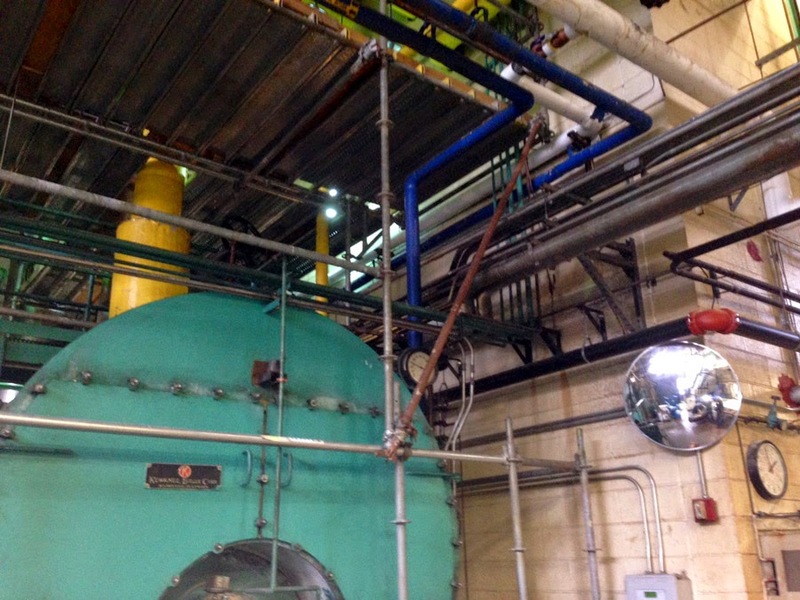 The mechanical room at the Bryn Mawr hospital is a perfect example. 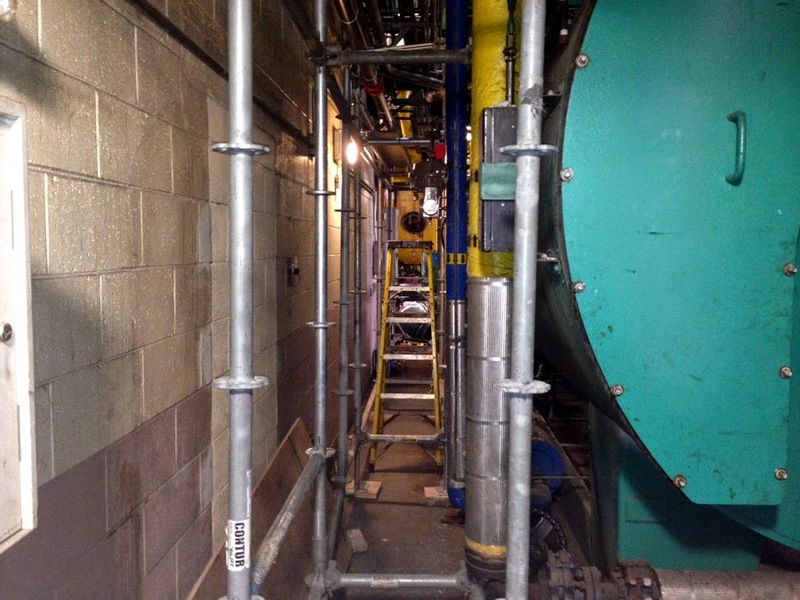 There was virtually no room in there to get the scaffolding in – let alone set it up. 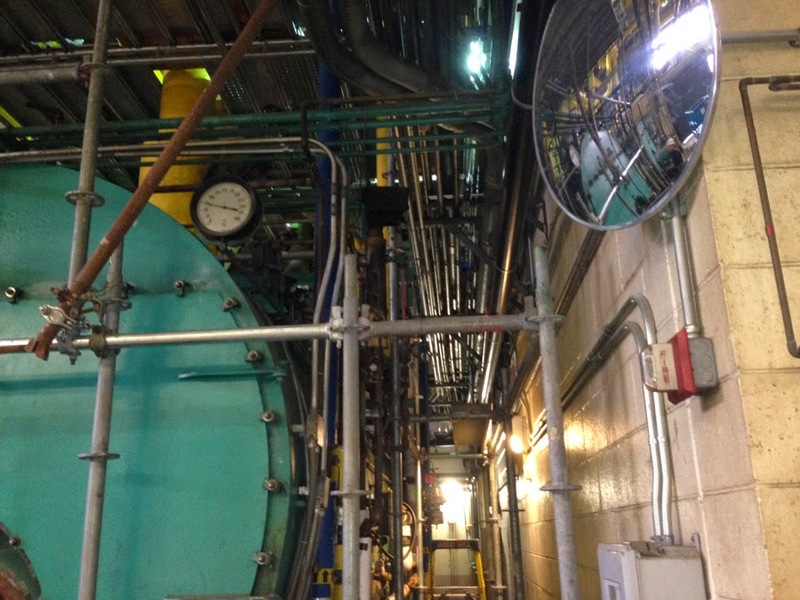 Crews needed to get on top of this maze of equipment to install pipe for new HVAC and to run two new electrical lines above that massive green tank. But how could they get “up air” safely to do it? 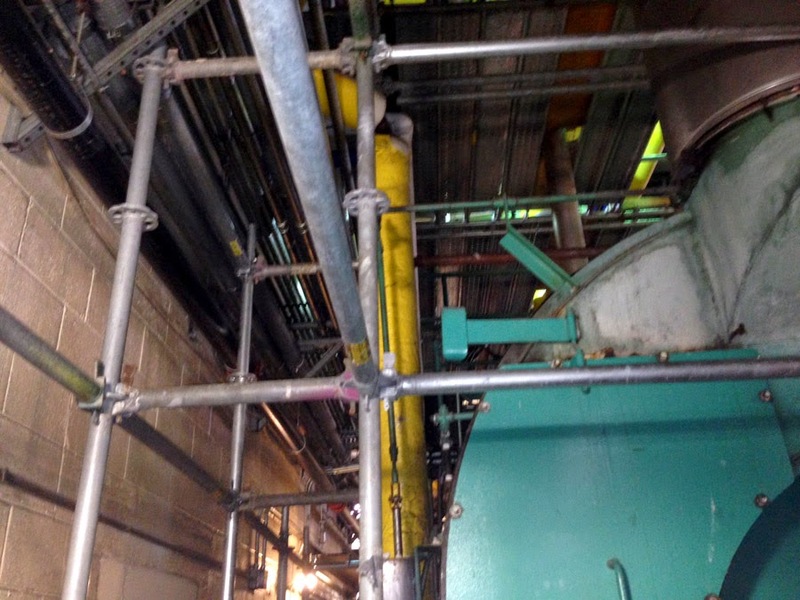 Superior scaffold devised a plan to navigate the spider web of equipment and get crews above it all where they could work safely and comfortably (check out the photos). 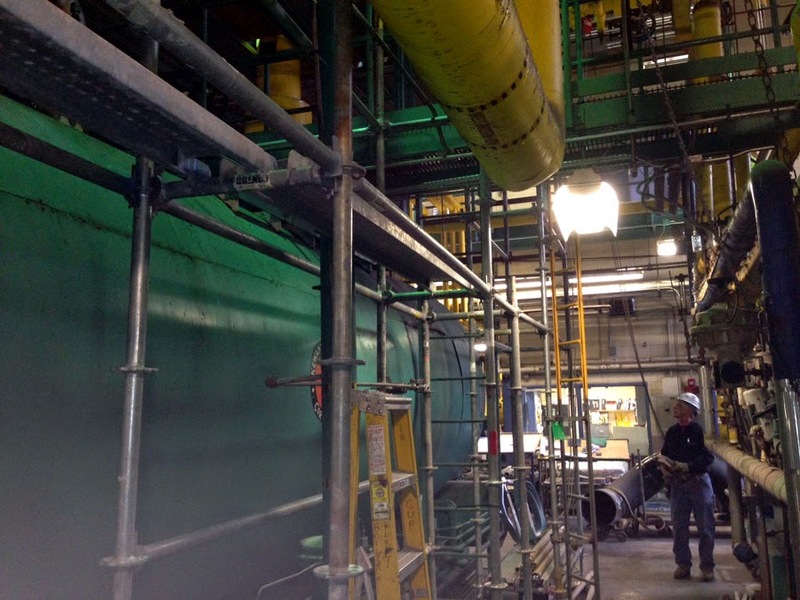 Superior used a combination of system scaffold, diagonals, decking, handrail and various other gear to create a safe working platform. In one picture you can even see that we had to cantilever one leg around the green monster to carry the decking above, very innovative solution in a tight space. The job was a smashing success. 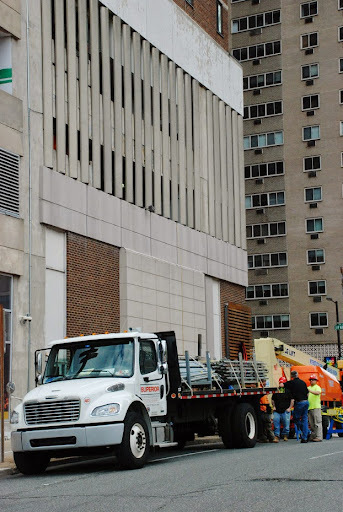 Crews got their work done safely and efficiently and the hospital was thrilled. 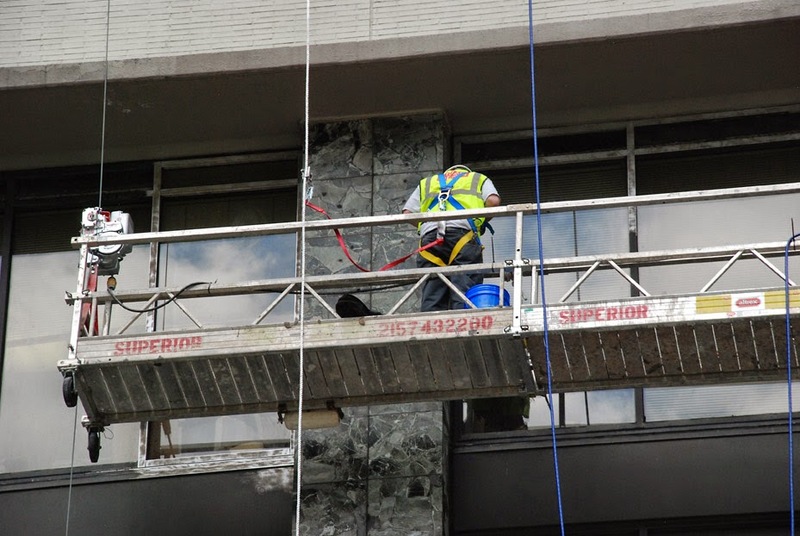 Superior Scaffold can help you get to that hard to reach area on your job. 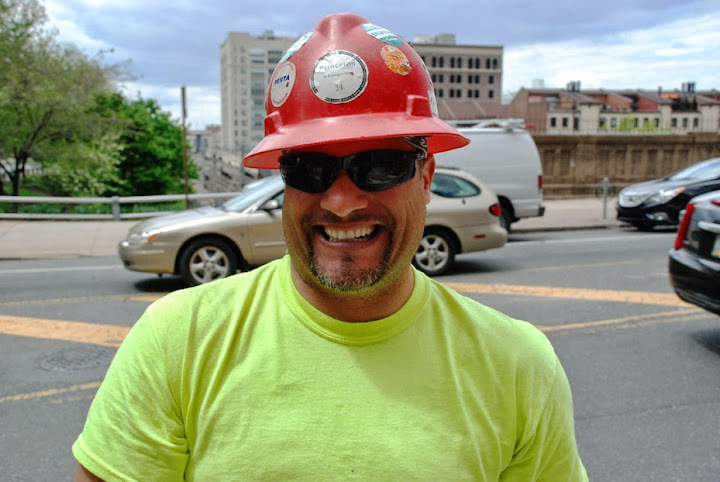 So when you need access, call the best (215) 743-2200 and ask for Pat – he’ll take care of you. 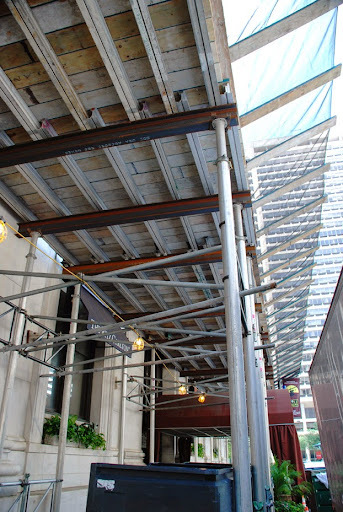 You can also visit www.superiorscaffold.com for more information. 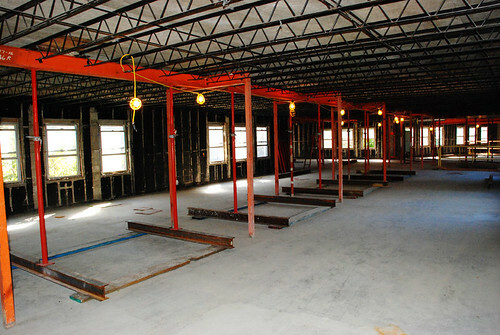 And for our final rental division – Shoring. In simple terms, shoring is the act of propping up with shores. 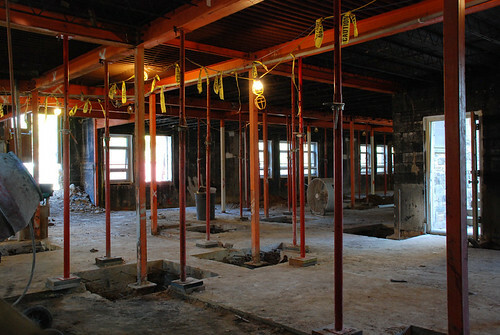 Shoring is a general term used in construction to describe the process of supporting a structure in order to prevent collapse so that construction can proceed. 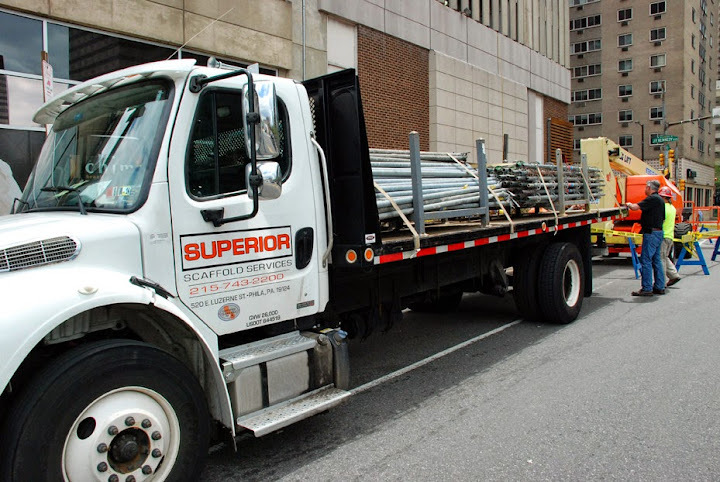 Superior Scaffold has been providing general contractors and construction companies with innovative shoring solutions for more than 50 years. 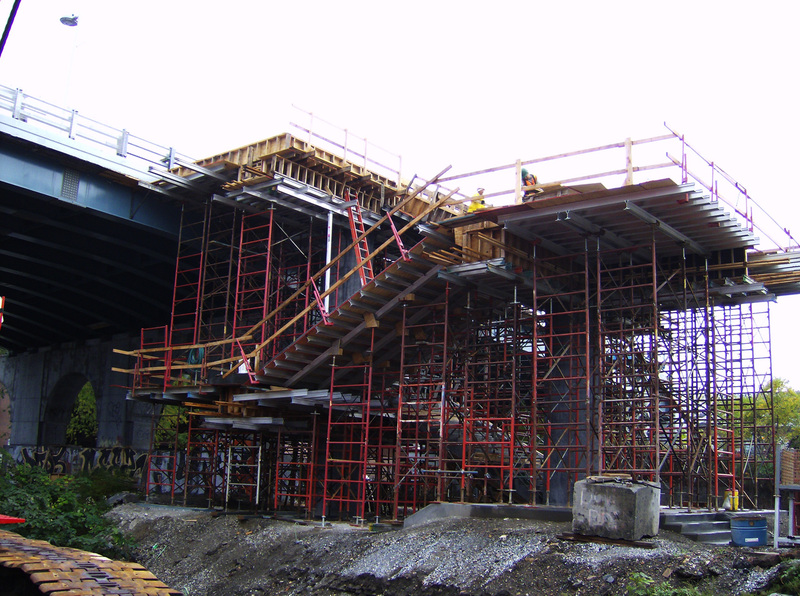 Now, a little more clarificaton – from the SSFI (Scaffolding, Shoring, Forming Institute) Shoring is not scaffolding and scaffolding is not shoring. The difference is in the use. 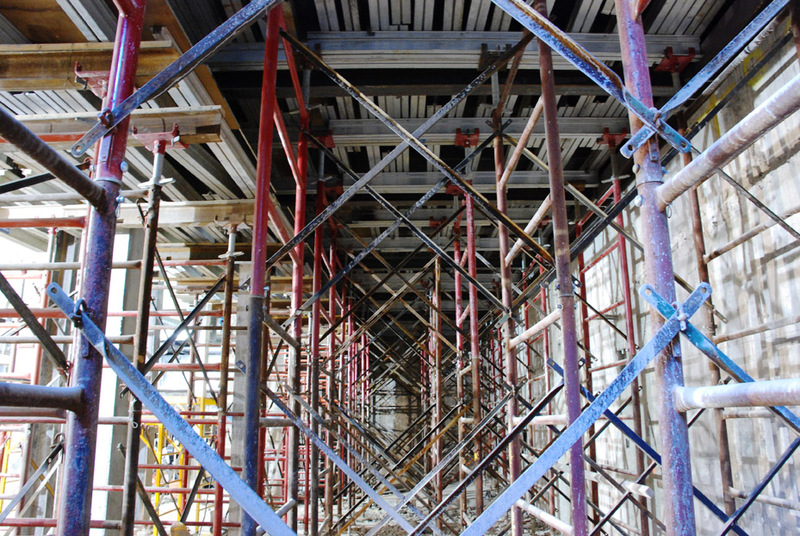 Although scaffolding is not shoring and shoring is not scaffolding, remember that each system requires proper fall protection, access, and strength. If layout work or load calculations are required, Superior has an in-house engineering staff available for customer support. 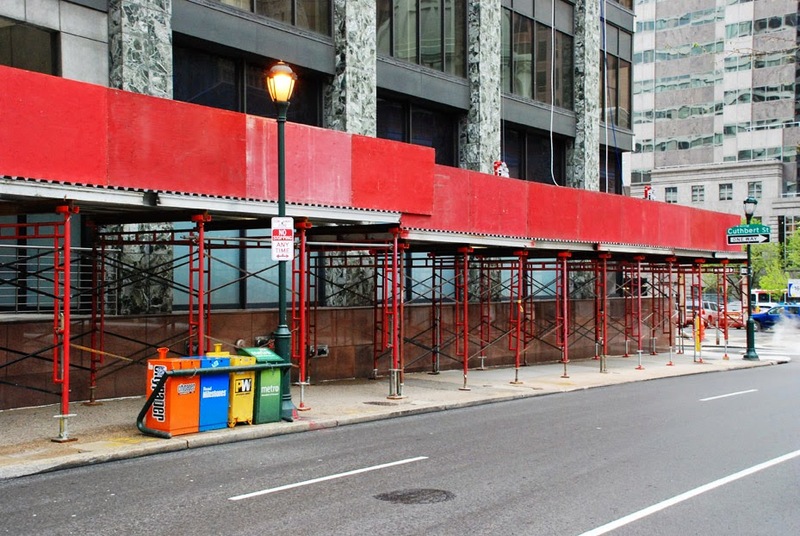 For further information, call Superior Scaffold at (215) 743-2200 and ask for Mike. 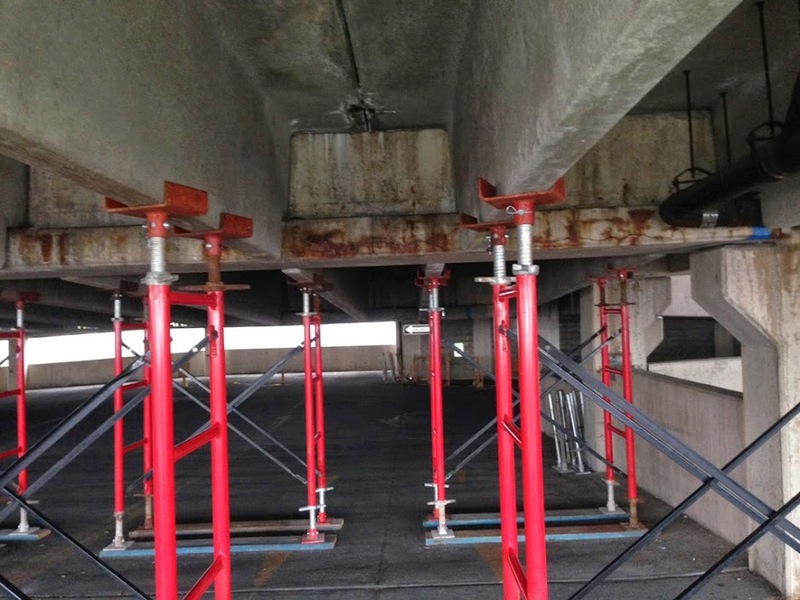 Either way – Superior offers a wide range of Shoring sizes and configurations that are available for any application. 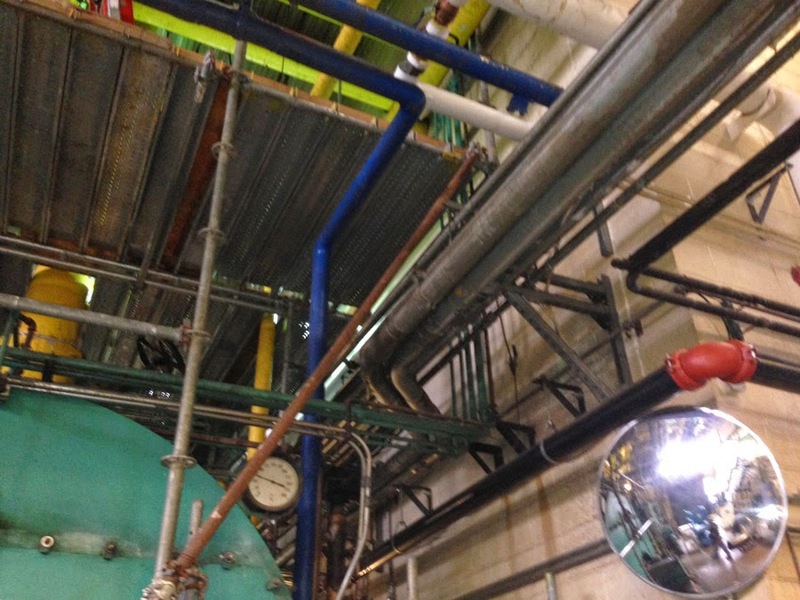 Our diverse shoring line allows users to complete the most complex jobs. 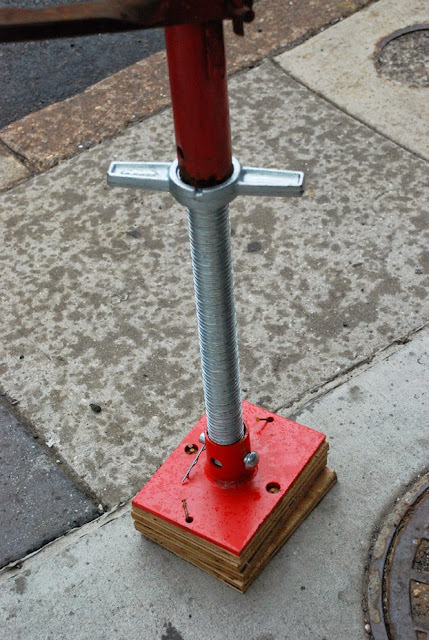 Here are some popular rental items from our Shoring division. Hi-load Frame, Non load bearing ledger, post shore, kip shore, frames, etc. Aluminum joist, stringer beam, steel junior beam. 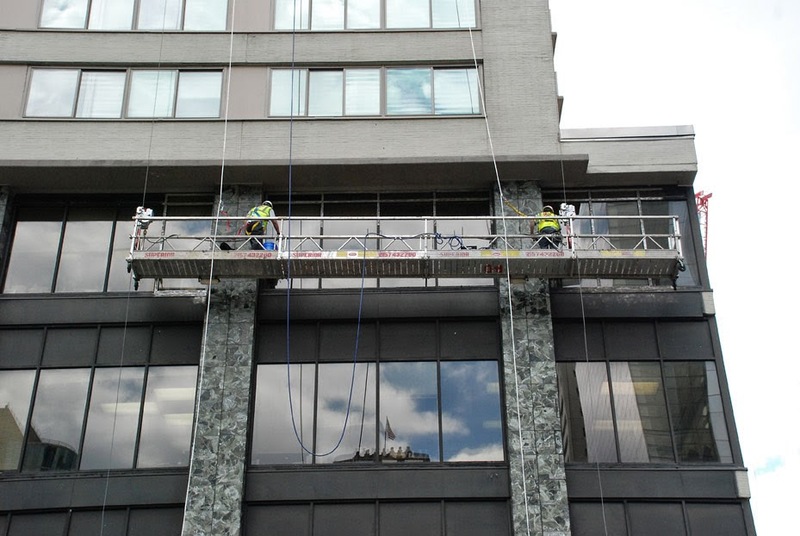 We also rent a full line of decorator scaffold (painter scaffold, baker scaffold), debris chutes, netting, safety equipment, and much much more.